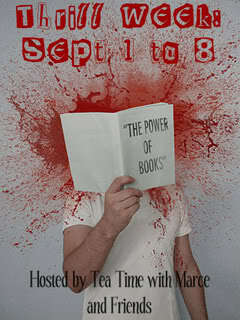 red headed book child: Thrill Week Begins! hosted by Marce at Tea Tim with Marce. We are both HUGE mystery lovers and she created this event to find more of you mystery lovers out there and celebrate all things mysterious, suspenseful, horrific and thrilling! To begin the week, check out the Questionnaire below, part of the BLOG HOP and find out a bit more about what I love about the mystery genre. Stay tuned for more fun all this week. What is your favourite genre out of Thriller, Mystery, Suspense and Horror? Why? I enjoy thrillers the most. I enjoy when ordinary folks are put in extraordinary situations. Literary Thrillers and Suspense would be a close second. I love Tana French and the world she creates in her books. But really, I love it all. I am just a fan of all things mystery! Who are your top 3 authors in those genres? Tell us who your favourite male and female authors are in the genre? Joy Fielding and Harlan Coben definitely! What book do you remember loving but don't remember the details? Maybe you should read it again now. Red Leaves by Paulina Simons, a literary thriller. I haven't read any new horror, sorry. What series or trilogy would you recommend in these genres? I don't read a lot of horror. My favorites are John Saul and Dean Koontz. Recommend 1 or 2 books that you think more around the blogosphere should read. In the Belly of Jonah and Lot's Return to Sodom by Sandra Brannan. I can't say enough good things about this author and this new series. Every mystery reader should read these! What authors have you tried and look forward to reading more from them? Maybe we can give you suggestions on what to read from them. What authors in the above genres are on your TBR list but you haven't tried yet? Who should I read soon? Start with See Jan Run. Now. Run don't walk to the bookstore. I hope I could "thrill" you all a bit! Now I have Mystery authors a plenty in my head. I also love Nicci French, Dennis Lehane, Lindwood Barclay, Benjamin Black, Laura Childs, M.J Rose, John Connolly. Chelsea Cain...to name a few. Why have I not yet read Tana French?? I have the first two.. just need to get to them. And In the Belly of Jonah I have as well! I feel so left out, I need to read Harlan Coben very very soon, so many mentioned him. Of course I have read or already have your choices on my list because of you. Have fun adding to your Wishlist. Thanks for being a featured host. Thomas Perry should be on your TBR list. So happy to see Joy everywhere on your post! I did read a great thriller earlier this year from a writer I had never read before: Ordinary Thunderstorms by William Boyd. Just terrific! I used to read A LOT of John Saul! But I haven't read him for a very long time... I don't even remember why I stopped... maybe I should try him again. Joy Fielding is high on my fav lady authors list - great books. And Dean Koontz! Sandra Brannan is someone I need to check the library for - have seen those books mentioned on blogs but not sure they're available here. Love Joy Fielding....and Dean Koontz. Karin Slaughter is good - you must try hers. Have seen the Sandra Brannan books mentioned before and keep meaning to check whether the library has them.